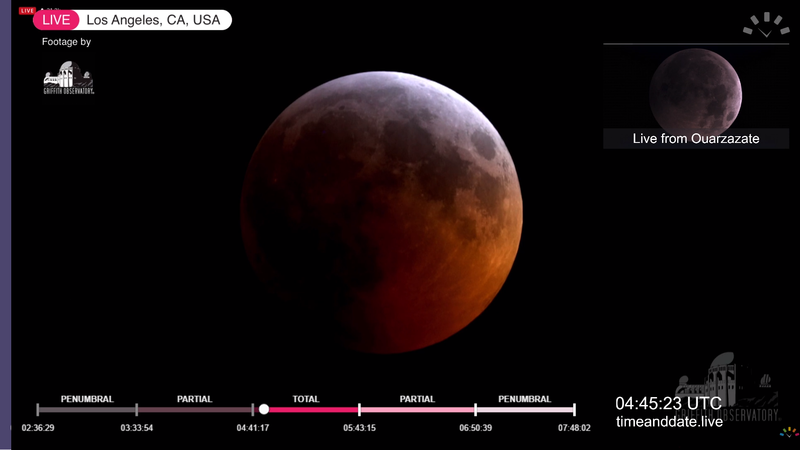 This coming Sunday night, January 20th, there will be a total lunar eclipse visible from French Guiana. A fantastically resourceful organisation, timeanddate.com, will provide direct coverage of this event and have asked us at Europe’s Spaceport to contribute since we will actually see it fully. 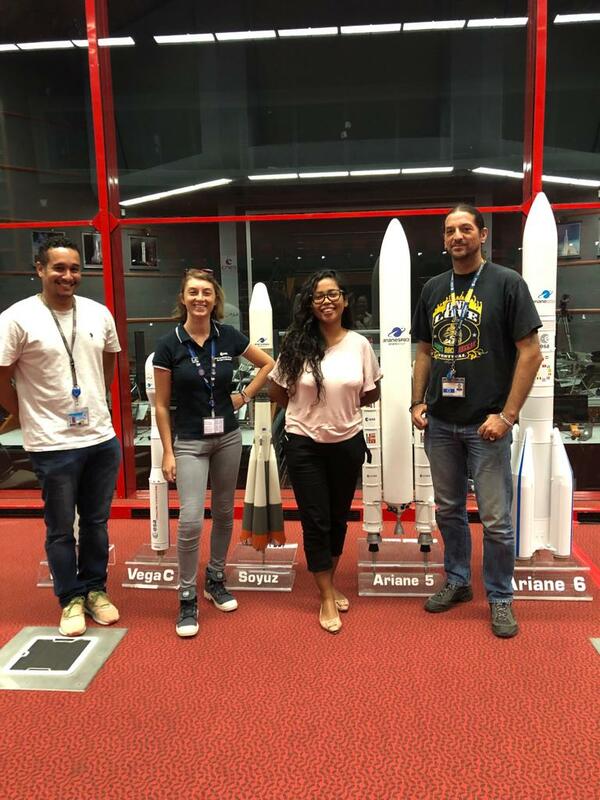 The astronomy club of Kourou Pulsar, founded in August 2017, immediately responded and set up the necessary means to distribute images with the aid of both ESA and CNES staff. 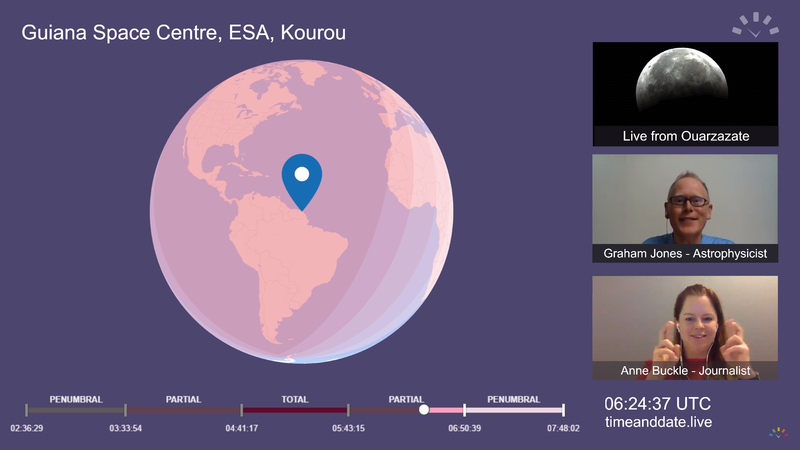 Back in 2017, on August 21st, the ESA team in Kourou already did this for another lunar eclipse; on that occasion, only 55% of the eclipse was visible from Kourou. This time we are in prime position as 100% will be observable, weather permitting. The organisers, timeanddate.com, will be operating from Japan — which is quite precisely on the complete opposite side of the globe from Kourou! So this morning we did a video session where I answered questions posed via mobile phone by a team member, Graham, in Japan. The video team from the Spaceport filmed me (with my headphones) answering the questions. It felt a bit funny staring into a camera, speaking to a person on the other side of the globe that no one in our room could see and only I could hear… I am curious to see the result on Sunday. I was present for a few hours, 23:30 – 01:30. We were standing on the parking lot outside the Spaceport’s control room in our shirtsleeves while other observers in Europe were bundled up in multilayers of clothing to protect against the cold January night. Using my binoculars, I had a good view of the moon, craters and other features that were clearly visible. The telescopes had a good view until a big cloud obscured the moon… but by then, I had to leave anyway in order to be able to work today. We will have to wait until the next lunar eclipse: a partial eclipse in July. Kourou was still featured on the timeanddate livestream, which was wonderful to watch. You can watch the 4 hour (!) stream on YouTube here. The livestream was hosted by Anne Buckle and Graham Jones and featured live footage all the way from Morocco to Los Angeles.